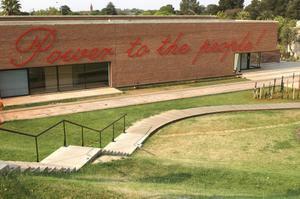 Sue Williamson: For the Sasol Wax Art Award 2008, you are making a very large scale text piece, to be installed on the outside wall of the Gallery This reads ‘Power to the People!’ and in 2008, it has obvious references to the fact that the people very often do not have power – electrical power, that is. This is typical of the way you have consistently worked with ideas, and in this case, with text to give what you have referred to as a ‘tragi-comic insight into events’. Would you agree? Brett Murray: I realize when I look across what I have done and what I intend to do, is that there is a kind of consistency. That consistency is critical entertainment…which is basically the definition of satire. But within satire, there is a range from the one-liner to something more open-ended, more metaphorical, where the humor is more layered. I try and work within all of these. SW: When I first met you, in the mid-eighties, you were quite politically involved. Were you ever personally involved in graffiti actions? SW: I would say that phase has seen you right through to this current ‘Power to the People’ piece that you’ve done. BM: It has. There is definitely a thread between them. I enjoy public art: working within the public arena and the constraints of that arena. 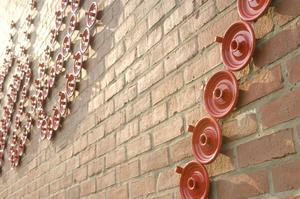 And this piece, although it is on the grounds of the university, it is on a public-facing outside wall. I enjoy making things that are within the contested public domain. I enjoy the constraints of legibility when I work in these areas. SW: You also enjoy using cursive script, don’t you? BM: Yes, this hand written script has a personal immediacy to it. I used that script for a piece called Continuity and Change for the 2nd Johannesburg Biennale fringe show, in 1997, ‘Smokkel’. SW: The text for that piece read: History is Always Written by the Winner! It has a direct link to this new piece. It was made just after the first elections, and you used old silver ten-cent pieces welded into script. BM: This work for Sasol has a similar motivation: to come up with a one-liner that is challenging, ambiguous and goading. When I was first approached as a top ten finalist, the first thing I thought of was candles and the first thing I thought after that was power outages, if you excuse the Orwellian term ‘outage’. Immediately I knew I was going to do something related to those two ideas, somehow. The phrase ‘Power to the People’ came to mind. BM: Exactly. So, I’m reflecting quite harshly on the new dispensation. SW: You have taken the essential slogan of the struggle, and twisted it very nicely to give it this new meaning: calling on the government to get their act together. BM: Absolutely. It’s a kind of a challenge. A protest, I suppose. SW: Why did you choose red for the candleholders that make up the slogan? BM: The candleholder that I always use when there are power-outages is a red one. So it’s anecdotal. I’m always cursing while the power goes and I must use a candle. I am imagining that across the country people are lighting their candles and cursing. A collective annoyance. In getting six hundred of these red holders together there is a hint of a kind of a collective protest. Also red is a very popular colour for graffiti. It just made sense. 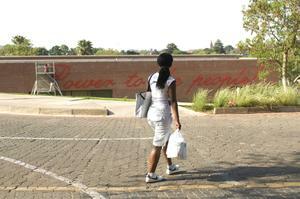 SW: Your work makes perfect sense conceptually, visually, and within the brief of the Sasol Wax Art Award. For his large scale text piece, Power to the People, Brett Murray chose to use as a basic unit the candle holder rather than the wax object it is designed to hold: the ordinary household white wax candle. The candles themselves are conspicuous by their absence. The task of obtaining the six hundred saucer shaped painted metal candlesticks required to form the letters of the text turned out to be unexpectedly difficult, a time consuming problem which Murray had not anticipated. Candlesticks were sold out everywhere, pointing to the aptness of Murray’s piece: it seemed as if the entire population of South Africa had stocked up with candles and candlesticks to cope with regular power outages. Pep Stores in Cape Town had sold out. So had Makro, and other trading centres and wholesalers. Eventually, Murray tracked down a Johannesburg company which had just brought in a replacement shipment from China, and he was able to buy the quantity needed for his artwork. 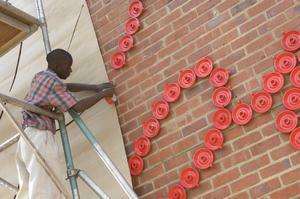 The ‘P’ of Power is three metres high, and the entire piece measures 29 meters long. Murray is a highly experienced and skilful sculptor, and generally speaking, his works are expertly fabricated for permanence. 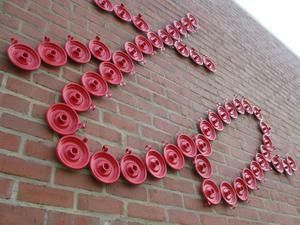 In the case of the work for the Sasol Wax Art Award, however, rather than weld together an indestructible support structure for the text, Murray will attach each candleholder individually to the wall with industrial strength double-sided tape. Thus, the piece will be technically related closely to the protest poster stuck to the wall, rather than to a flawlessly crafted and structurally strong museum piece which can be moved from one art venue to another. Murray also wished to work within the tradition of the readymade or found object rather than the tradition of sculpture. Should one of more of the candlesticks be dislodged from or fall off the wall during the run of the exhibition, again, this would be in the nature of graffiti, in which letters get defaced or rubbed out over a period of time. Although the candlesticks come in a number of colours, including a bright turquoise and a bottle green, Murray chose red, the colour of his own personal candlestick, and the colour of flame, and heat. Stuck on the wall to stand slightly away from the facebrick surface, the candleholders will cast a moving shadow as the sun moves through the day, giving the words a dropshadow, or three dimensionality.